In the Autumn of 2017, I got picked up for representation by Art Republic, an organisation with galleries both in Brighton and London and with a huge online presence. 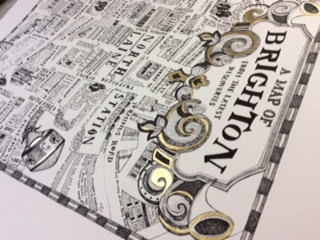 Initially they took on just a few of my maps; the map of Brighton and also the Moon map. Alongside the standard prints, they suggested creating a few exclusive limited editions for small print runs. So it was with this in mind that I started to think about how I could adapt each image to make them something a little special. The moon limited edition print was an easy choice. 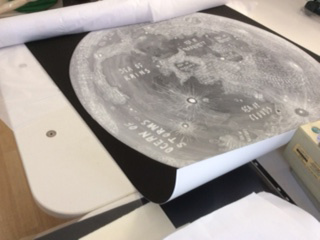 A couple of years ago, a friend had asked how possible it would be to create a super moon – a print of the map at a square metre in size. This felt unwieldy in reality so it developed into a slightly smaller version with dimensions of 70 x 70cms. Still with some wow factor, I think, it’s just right to act as a huge focal point to a room. The Brighton map was more difficult to adapt. I thought about adding colour but this could only be done using photoshop. As I stress the importance of working by hand in my work, that didn’t feel so appropriate….Which led me to the idea of hand gilding each print. I love to learn a new skill but there were definitely a couple of practice pieces needed before I felt confident enough to send a piece out to the gallery. First apply the gilders’ size where you need the gold to be. It’s easy to paint on but more difficult to wait for it to dry enough to apply the gold. I watched lots of You-tube videos and read online articles to understand the craft better and the ‘wait’ is very important. Apparently, historical gilders used to use a feather, dragging it over the size to check dryness. If the feather stuck, it was too wet. If it just caught, the size was perfect to use. 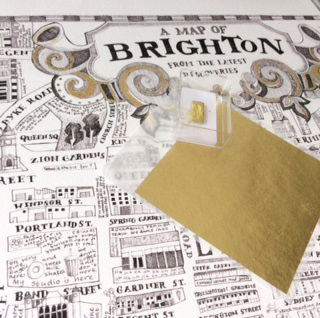 The gold comes in mundane little packages of backed square leaves. Real gold leaf looks much better than ‘gold’ foil which will tarnish, given time. Using tweezers, lift each delicate piece, cut roughly to the right size and place over the area covered in size, pressing down with a clean paintbrush. The gold leaf will stick where the size is so you need to brush away the excess, again using a soft brush. It’s hard not to waste the gold – but there’s something magical about seeing the specks air-dancing in the breeze. I think applying gold leaf in this way probably works better for larger and less defined areas but for my purposes, I’m using it for small distinct elements of each map. Sometimes, it’s not possible to create a hard edge and lines become a little fuzzy. Where this happens, I use shell gold to neaten up and fill in the gaps. Shell gold has a definite mystery about it. There are only a few specialist places it can be ordered from in the UK and each tiny pan (about the same size as a normal watercolour pan) costs around £30 and is delivered as a small brown-wrapped signed-for package. It’s made from real gold mixed with gum arabic and is applied to paper using water as if it is paint. A little goes a long way. It was traditionally used on manuscripts and icons both in the West and East and called shell gold because the old scribes mixed it up using mollusc shells as a palette. 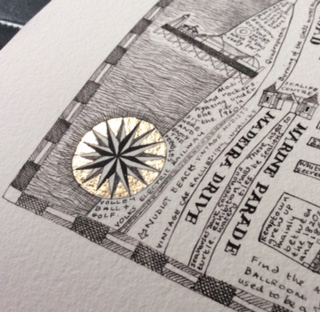 In this way, using gold leaf and shell gold, each print is hand finished and looks slightly different from the next. It’s a fiddly job but ultimately very satisfying to do and I hope adds something very special to each map.